Inventor Robert Kettlety has created a new portable wind turbine called GIGA that is capable of harnessing wind to generate power to help keep your mobile devices, cameras and other equipment powered while you are away from the grid. 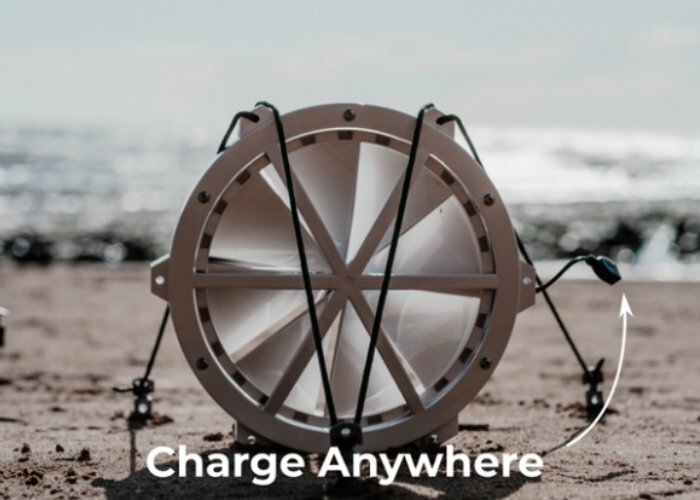 The portable wind turbine offers USB charging and is enclosed in a waterproof, impact resistant casing enabling it to be quickly and easily deployed. Launched via Kickstarter this month the GIGA wind turbine is now available to back with early bird pledges available from just £99 and worldwide shipping expected to take place during June 2019. Watch the video below to learn more about the GIGA portable wind turbine and its features. – Wind is abundant in nearly every location and finding a good spot for solar or a flowing river can be tricky. – Solar panels work during the day and require consistent exposure, this is not easy when hiking through terrain. They also don’t work at night when you are in a fixed location. – Our turbine starts charging your devices without a sound at the slightest breeze. – The GIGA Turbine is quiet, so it is just you, nature and your phone (A device that needs charging each day) to take tonnes of gorgeous pictures. – Large rivers and running water can be very dangerous, especially when out alone. The GIGA Wind Turbine reduces this risk and helps to keep you safe while staying connected. – Wind has been used for centuries for grinding corn and powering machinery, we’ve now harnessed it for a small, portable and lightweight turbine. – A secondary safety device providing charging power for devices in locations with little sun, no flowing water and when your batteries are empty. – Make the most of the evening breeze and charge you batteries up over night while sitting in your tents, around the fire and sleeping.